Whitehall came alive Monday (9 May) with Russian patriotic songs and Victory banners. About two thousand people carried portraits of their next of kin, who gave their lives fighting to free the world of Nazism. 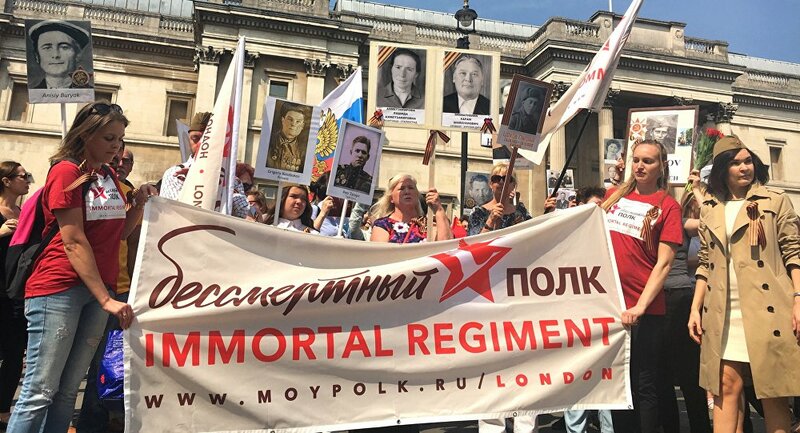 The grassroots initiative to celebrate all those heroes of the "Immortal Regiment" swept through Russia like wild fire. Last year some 500,000 people gathered to march through Moscow's Red Square, along with Russian President Vladimir Putin, while the total number of participants across the country was estimated at 12 million. London has held its own march for the first time and the volunteers who organized it were expecting a turnout of about 200 people. In fact, about two thousand showed up — Russian speakers from all corners of the Soviet Union, who now live all over the United Kingdom. They shared their family stories with each other and Londoners who were fascinated by the size of the procession and its message — "never forget." Aleksandr Kandaurov, a native of Crimea came with two portraits — of his grandfather and his uncle-in-law. His granddad was a pilot and was shot down towards the end of the war. Luckily, he survived. Aleksandr Kandaurov holding portraits of his grandfather and uncle-in-law. Nikas Arabidis' father was a lot luckier — he went all the way from Russia's western borders during the Soviet retreat in 1941 back to Germany in 1945 — and then on to the Far East to finish off Japanese Army in China. An ethnic Greek from the Caucasus, Nikas now lives in EU, and his son Gavriil was born in Greece, but they say that 9 May is still the greatest day of the year to them. They were not the only ones whose relatives fought all the way to Berlin and then to Manchuria. Oktam Matyakubov's grandad Pernazar took this journey from his native Turkmenistan, and returned back home highly decorated. Oktam Matyakubov holding a portrait of his grandfather Pernazar Matiakubov. The march passed by Downing Street where it was joined by Russian veterans of the Arctic convoys, marking the 75th anniversary of the first one. The gates to the Prime Minister's residence are always besieged by tourists but this time they all wanted to take a selfie with the Russian sailors. But probably the most inspiring thing about this march was a huge banner made by the kids of a London Russian language school. Children aged 5 to 12 from various ethnic communities joined hands to paint their thanks to the veterans and their wishes for a peaceful world on a big piece of canvas. They continued to add their drawings and autographs during the march and will do so until the one next year — and beyond.